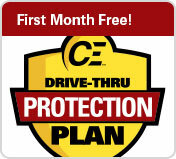 Stop worrying about your next potential repair and get peace of mind with CE Drive-Thru Protection Plan. Protection Plans offer unlimited repairs at one low monthly payment, and if you sign up now, your first month is on us! Plans cover all models and brands. Call 877-731-0334 for details. Need batteries? Get a free battery from CE! We know that batteries are a necessity for your drive-thru, and it’s our job to keep you stocked. Purchase 3 CE branded batteries for any HME, Panasonic, or 3M system and get your 4th battery free. Offer valid on CE branded batteries only. Free battery must be of equal or lesser value. Use promo code PCBATW. Have your broken headsets been collecting dust? Just haven't gotten around to sending them in? Well there's a special discount just for you! If you haven't used CE within a year, we want to offer you $75 off any all-in-one headset or belt-pac repair from any brand. Take advantage of our quality repairs with same-day service and a 4-month warranty. Some restrictions and conditions apply. Call for details. We want to reward you for your commitment to us. For every $100 you spend on a repair with CE we will give you $5 in Bonus Bucks to use on repairs in future. It’s just like cash, only better! Use them on your next repair or save them up for a larger discount later. Have multiple stores? Save more with the multi-store saving program! Save up to 25% off select products and services, just give us a call at 1-877-731-0334 for more details. Need batteries? Get a free battery from CE! We know that batteries are a necessity for your drive-thru, and it’s our job to keep you stocked. 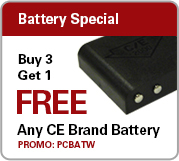 Purchase 3 CE branded batteries for any HME, Panasonic, or 3M system and get your 4th battery free. Offer valid on CE branded batteries only. Free battery must be of equal or lesser value. We know you don’t want to chase down the best price. That’s why we guarantee that you’ll always get the lowest price at CE with 100% satisfaction. We will beat any competitors’ coupon to ensure you’re getting the best deal. Just provide the coupon, and we’ll work out the rest! Offer valid for repairs and accessories only. Some restrictions apply. Competitor’s coupon must be provided with order. Coupons subject to verification. Cannot be combined with any other offer. Headsets are one of the most critical pieces of equipment in any drive-thru operation. Our fast, reliable repair service ensure that your drive-thru headsets are always in tip-top condition. *Some restrictions and conditions apply with all coupons and discounts. Call for details.